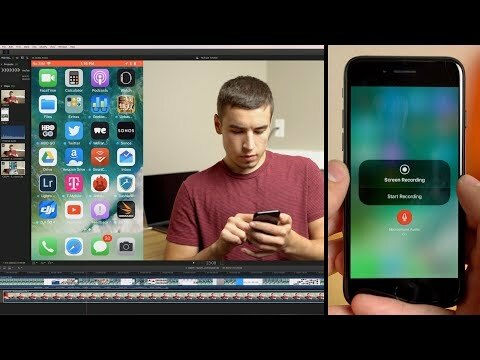 A potentially handy feature discovered in Apple's iOS 11 is native screen recording support, invoked through a command in the overhauled Control Center interface. To use screen recording, people must first pin the option to Control Center via the iOS Settings app. Within the "Control Center" menu, users can choose a variety of commands to include or exclude. The recording feature captures everything that happens, which can be useful for how-tos and other shared videos. A blue bar at the top of the screen indicates that recording is in progress. Tapping the bar will trigger a pop-up dialog allowing users to quickly stop shooting. Videos are then saved to Photos for viewing and sharing. Some other iOS 11 enhancements include a Files app, person-to-person Apple Pay transfers, and iPad-oriented upgrades such as drag-and-drop, a Mac-style dock, and simpler multitasking. iOS 11 is now available for iPhone, iPad and iPod touch. This will be really helpful for creating demos, instructional videos, and even promotional videos. Perhaps i I didn't see it (damn my eyes!) but what about simultaneously recording audio? Awesome! As a math teacher, this will be very very helpful in ore recirding examples to use in class. I can't find "clear all notifications" in iOS 11 beta. For me, that was the best 3D Touch item. I hoped the Bluetooth area gets some attention for tens of different Bluetooth devices. As someone who primarily uses his iPad as an art machine, this will be wonderful for live drawings! In fact a lot of the iOS 11 iPad updates seemed geared toward art users. FYI, I know that the Sketch Club app (great for sketching and painting) has screen recording and I think that Procreate also has this feature. This is a welcome addition, if it makes it to the final release! I don't see anything stating this is for live video / streaming, but yes, many of the top tier drawing apps record your strokes and can export a video after the fact. I too was hoping for the ability to reorder and rename Bluetooth devices. The ability to prioritize WiFi networks would also be welcome.